Music programme featuring live sessions from contemporary and classic artists. Guests on this show include Corinne Bailey Rae, Sir Elton John, Bloc Party and Kronos Quartet. Joining Jools on the show this week, Leeds's finest, Corinne Bailey Rae, who made her debut on Later back in 2005, previews her third album and her first in six years, The Heart Speaks in Whispers. The album was produced here and in LA and she introduces her new band featuring husband and co-producer Steve Brown. 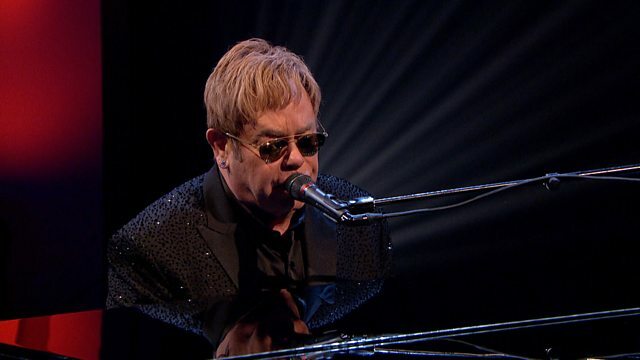 There's a solo visit from Sir Elton John, borrowing Jools's piano to perform numbers from his 32nd album, Wonderful Crazy Night. London's Bloc Party have reinvented themselves with a fifth album and the first in four years - Hymns - drawing on dance rhythms and using gospel vocal settings driven by their new rhythm section to sound both melancholic and ecstatic all at once. San Francisco-based Kronos Quartet have been going well over 40 years and continue to be perhaps the foremost interpreters of contemporary classical and new music. Here, they drop in from a British tour to share their stunning arrangement of Blues legend Geeshie Wiley's Last Kind Words. The line-up is completed by two artists making their UK TV debut on the show. Firstly, Mancunian energetic new comers Spring King, a four piece started by singer and drummer Tarek Musa, who are quickly becoming known for their lively shows and high-energy garage rock tunes. Secondly, from Canada, indie-folk singer songwriter Basia Bulat. Born in Toronto and raised by Polish immigrant parents, she enlisted My Morning Jacket's Jim James for production duties on her recently released fourth album Good Advice, which sees her toning down her trademark autoharp in favour of dazzling, technicolour pop.